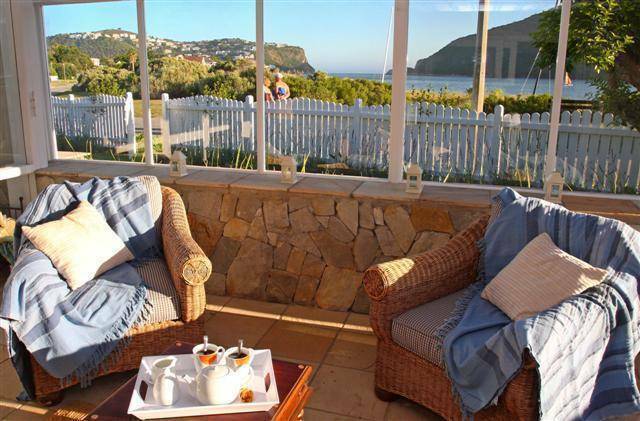 Situated on a picturesque lagoon beach on Leisure Island in Knysna, Bay house is ideal for a family beach holiday. With accommodation for up to 10 people (minimum of 4), this luxury, 4 Star, self catering holiday home is superbly located and well-equipped to cater for families with children of all ages. 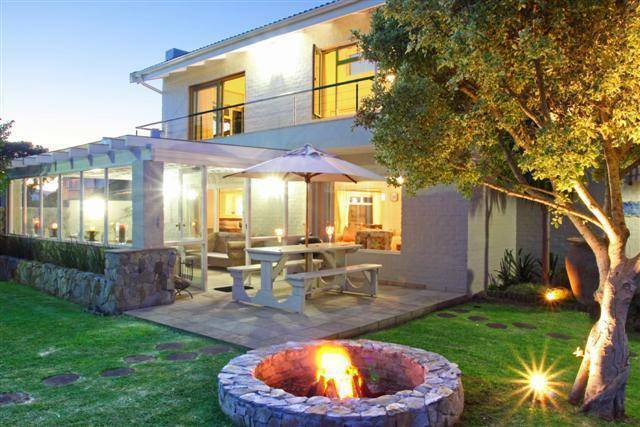 Leisure Island is the most sought-after destination for holidaymakers in South Africa’s Favourite Town. 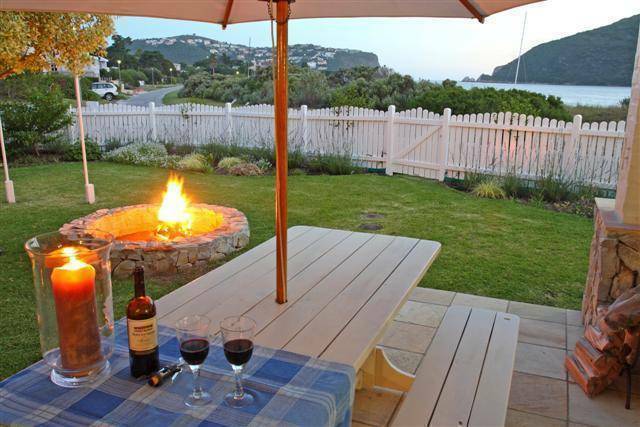 A small island (just 4km in circumference) in the lagoon, it is linked to the mainland by a causeway and is secure, private and tranquil with many delightful beaches and panoramic views of Knysna, the famous Knysna Heads and Featherbed Nature Reserve across the estuary. Bollard Bay is the main beach on the island and offers plenty to do for young and old. When the tide is high you can swim, fish, canoe or sail. At low tide, pump for prawns to use as bait or walk across the sand as far as The Heads. The island becomes a hub of activity during school holidays and older children will revel in the vibrant social scene. The streets are quiet and safe for walking, jogging, skateboarding and cycling. And the buzzing cosmopolitan town of Knysna is just 10 minutes away. Bayhouse is an airy, spacious two-storey home with stunning views of the beach and lagoon, every modern amenity and numerous comfortable indoor and outdoor living areas. There are six bedrooms, each of which can sleep two people, and four bathrooms in total. In addition, babies and infants are catered for with a baby bath, camp cot, high chair and stroller. All six bedrooms are bright, airy and simply furnished in keeping with a beach-house theme. Beds are beautifully dressed with crisp white 100% cotton percale linen, non-allergic pillows and electric blankets. Extra blankets are supplied as well as thick, luxurious white bath sheets, hand towels and facecloths. The house has three lounges, giving guests plenty of space, even on rainy days! All the tiled living areas have under floor heating. Downstairs, the main lounge has a fireplace and comfortable seating for six people. It is open-plan with the eight-seater dining room and six-seater bar/breakfast counter area. A large drinks cabinet stocked with glasses, a TV, DStv Dual View decoder (Premium menu) and a DVD player add to the home comforts. An excellent selection of books, games and puzzles are provided for guests. The lounge opens onto an entertainment patio with a plunge pool, a Weber Gas Grill, a conventional wood-burning braai (barbeque), a gas heater and wooden table with benches and umbrella. The adjacent conservatory is protected from the elements and can be fully enclosed with a pull-down awning. This glass structure has seating for six people and is just meters from the beach. Off the living area, a fully equipped kitchen can cater for 10 people and is fitted with a double door fridge/freezer, an electric stove with oven and a microwave. The scullery has a dishwasher, washing machine and tumble dryer. Basic cleaning supplies including washing powder, dishwashing liquid and dishwasher detergent are provided as well as tea, coffee, sugar, jam and bread. Upstairs, the lagoon-facing lounge is a sizeable space which was once the studio of well-known South African artist Dale Elliot, a previous owner of the house. The upstairs family lounge has a TV with DStv Dual View decoder (Premium menu) and a DVD player, and is stocked with games and puzzles. Storage is important when you’re on holiday! Our double garage provides plenty of space for two cars, a trailer and all your beach toys. There is extra off-street parking for two cars. The garden has a fire-pit where guests can enjoy cosy fireside evenings with family and friends, while watching the sunset and hearing the water lapping up against the seawall. There is air-conditioning throughout the house, gas fireplaces in the upstairs and downstairs living areas and underfloor heating in the tiled areas. BEDROOMS All six bedrooms are bright, airy and simply furnished in keeping with a beach-house theme. Beds are beautifully dressed with crisp white 100% cotton percale linen, non-allergic pillows and electric blankets. Extra blankets are supplied as well as thick, luxurious white bath sheets, hand towels and facecloths. Children’s bedroom: This spacious, air-conditioned prettily decorated room off the family lounge is ideal for children and has lagoon views, a queen-size bed and a chest of drawers stocked with toys and books. Loft suite: The loft suite sleeps four people and is suitable for a couple with two children, or four teenagers/children. It can be accessed from inside the house through the upstairs living room, but also has its own separate entrance from the garden. The mezzanine level has a double bed and is air-conditioned, while the lower level has a second bedroom with two single beds and an adjoining bathroom with a shower. Knysna is a town in the heart of South Africa's beautiful Garden Route just East of Cape Town. Knysna lies nestled in between the Outeniqua Mountains and the Indian Ocean. 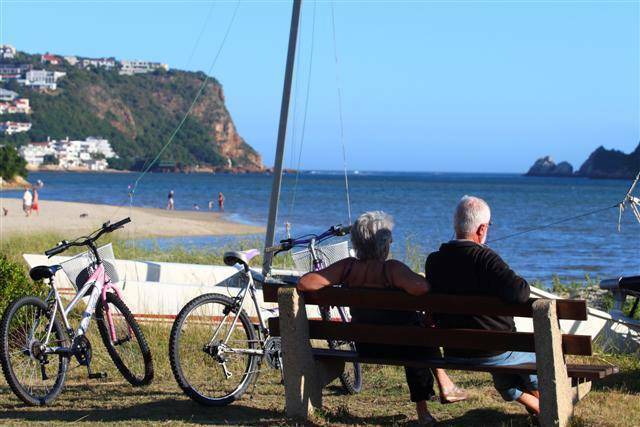 Knysna has twice been voted South Africa’s favorite town, and with good reason. It’s a friendly, welcoming town with lots of attractions and activities. If the tide is in, there’s very safe swimming at Bollard Beach towards the ‘top’ end of Leisure Island. It’s also got a sandy beach ideal for sand castles. At the ‘bottom’ end of the island, there’s a grassy, shady picnic site with BBQ facilities and toilets. If you want a very long romantic walk along the beach, you can walk all the way from Brenton-on-Sea to Buffalo Bay (about five miles). Don’t ignore any warning signs on the beaches as very strong currents do occur. Knysna is surrounded by patches of state forest in which there are paths of varying lengths. Pick up a map at Knysna Tourism and a permit at the forest If you’re a mountain-biker, there are various routes to explore in the state forests. At Millwood, there’s the 19km Homtini Cycle Route which starts at the Krisjan-se-Nek picnic site. In Diepwalle, there’s the 24km Petrus-se-brand Cycle Route which ends at the Garden-of-Eden. Soweto outside Johannesburg is the township that’s known internationally, but like many a South African town, Knysna also has a township which has realized that tours are one way to generate some income. You can take a township tour and visit one of the largest Rastafarian communities in South Africa. Tree spotting has a distinct advantage over birding, what you’re trying to identify stays put. Start by stopping at any ‘Big Tree’ sign you see, then progress to a walk in the woods, tree guide in hand. The variety of habitats at Knysna makes for good birding year round. Look out for waders and sea birds at Woodbourne Marsh (alongside George Rex Drive) and alongside the causeway to Leisure Island, and for fish eagles upriver of the N2 bridge over the lagoon. Once your kids hand feed an elephant at the Knysna Elephant Park (off the N2 between Knysna and Plettenberg Bay) they’ll all want to ‘work with animals’ when they grow up. Remember to wear old clothes as you’ll get covered in elephant spit. If you’d wondered why the both heads of the Knysna Lagoon aren’t covered with houses, it’s because the Western head is a private nature reserve, called Featherbed. The tour starts with a 25-minute boat trip across the lagoon, then you’re driven up to the scenic lookout point where you choose between driving down again or do the 2, 2 kilometer walk through the milkwood forest and along the lagoon’s edge back for a multi-course buffet lunch. The road over Knysna’s Eastern Head and down the other side is extremely steep in places, but it’s the only way to get to a beautiful sheltered cove called Coney Glen. There’s a shady, grassed picnic site where you can BBQ, rock pools to snorkel in, and a sandy beach to sit with your camera to try to get that ultimate wave photo when the tide’s coming in. If you’ve a passion for steam trains, then a return trip on the Outeniqua Choo-Tjoe between Knysna and George will be on top of your list. If you’re not, it’s still worth considering the trip (though perhaps only one way) as the views are spectacular. Book online. The fishing is excellent in Knysna but first you need to buy yourself a fishing permit at the Knysna Post Office (corner Main and Montagu streets). Try fishing from the jetty in the Knysna Lagoon or in the surf off the rocks at Brenton-on-Sea or Buffalo Bay. If you want some beer to help, Knysna’s local brewery, Mitchell’s, offers tastings of its beers (08h00 to 17h00 weekdays and 09h00 to 13h00 Saturdays). Situated on Leisure Isle, within easy walking distance from the Bayhouse, the Island Cofee Shop serves scrumtious breakfasts and light lunches. There is an art gallery next door to browse through after or before your meal. Just acroos the road from the art gallery, the Tides Restuarant is a residents favorite. Tides only serve dinner and booking is advised. On George Rex Drive, just as you come off the island heading towards town. Marks is a family and sports lovers restuarant and cater for all occasions. They serve breakfast, lunch and dinner in a wonderful garden setting. At the Heads! Breakfast and lunch is served with breathtaking views of the Heads and the sea. A pizza lovers delight! Cornutti's enjoy one of the BEST positions in Knysna for discerning diners. Right at the point of the Heads, relax with sundowners or lunch and dinner from an excellent selection of Italian food! Bayhouse accommodation sleeps 12 people and this number may only be exceeded with the written consent of the owner of the Bayhouse. Should such consent be given, the latter reserves the right to increase the rental accordingly. CANCELLATION POLICY: A Full refund of the deposit (less 10% cancellation fee) to the guest on written cancellation provided this is more than four (4) calendar months from the arrival date. A 50% refund (less 10% cancellation fee) to the guest on written cancellation, provided this is between three (3) and four (4) calendar months and not nearer than two (2) calendar months prior to date of arrival. No refund on cancellation two (2) calendar months or less prior to date of arrival. We will endeavor to do our best to re-let the Bayhouse but cannot guarantee that this will be possible. Final payment is due before or on arrival to secure keys to the Bayhouse. Keys will be available from 9 a.m. until 5 p.m. Monday to Sunday from the owner at 113 Bayswater Drive, Leisure Isle, Knysna. Should you be arriving after these hours, please ensure that final payment has been made and that the owner has been contacted for instructions regarding our after-hours key collection point (which will include a map giving directions to the Bayhouse). Please note that your possible late arrival or early departure will NOT entitle you to a discount on the total rental quoted. Please deposit the keys at the Leisure Isle guard hut, situated at the entrance to the island, if you are vacating the Bayhouse outside of office hours. Please check the inventory list and notify the owner of the Bayhouse of any shortages or problems that you may have within 24 hours of your arrival. Please report any breakages or damage on your departure. 11 a.m. on the day of departure. Please do not remove furniture from the house or take garden furniture off the property. Linen and towels may not be removed from the house. Beach towels are not provided. We respectfully request that no smoking take place within the house as this may be offensive to subsequent guests. The Bayhouse together with its furniture, fittings and appliances is accepted as “voetstoets” in the condition in which it is found and shall be left in the same condition, fair wear and tear excepted. The owner takes full responsibility for the malfunction of any systems or appliances that may occur during the occupancy and will promptly call in repair persons to effect the necessary repairs. Neither the owner nor the Bayhouse shall be liable for any injury or loss incurred by the guests or the guests’ family, friends or visitors while they are on the property that has been rented. If you are visiting South Africa from abroad, you will probably fly to either Cape Town or Johannesburg. From these airports you can take a domestic flight to George. There are several budget airlines that fly between Johannesburg and George. George is less than one hour’s drive from Knysna and offers a wide range of car hire companies. Alternatively, you can drive directly from Cape Town to Knysna in around 5 hours on the N2. The route takes you across some amazing countryside. The R62 is an alternative scenic route, particularly if you are planning to visit Montague and/or Oudtshoorn. From George airport, follow the N2 to Knysna, passing Wilderness and Sedgefield. On entering Knysna, continue along Main Street, passing through town until you reach the turn-off into George Rex Drive. Turn right here and follow the signs to Leisure Isle. You will pass the Knysna Golf Course on your left. At the causeway, turn right onto Armstrong Drive to Leisure Isle. Continue on the causeway until you reach a stop sign and the guard hut, where you will turn left. This road, Cearn Drive, will take you along the Knysna Lagoon waterfront which becomes Bayswater Drive, until you reach Bollard Beach. Just past Bollard Beach, on Bayswater Drive, is Bollard Road and we are on this corner! 105 Bayswater Drive…..
Intercity coach companies offer daily services to the Garden Route from all major cities in South Africa.